Want to do your exchange in an affordable, warm and idyllic location? Porto, Portugal might be the right choice for you! Even though the winter months might be quite rainy and a bit chilly, there is plenty of sunshine and warm weather well until November. Budget won’t be an issue either as a nice lunch will cost you only 5 euros in the center and 3€ if you use the services of ISCAP, the university. I was surprised about the level of English, it is rather good in Portugal and the classes at ISCAP were actually held in English. The classes were quite similar to the ones in TAMK: there’s group work, some lectures and tests. There were two major differences: some classes were held even in the evening and students could choose between final or continuous assessment. In final assessment participation was not mandatory and there would be one final exam in January per course. Continuous assessment meant that 75% of the classes should be attended and there would be lighter tasks such as a group project and mini tests delivered throughout the course until Christmas. Like most, I chose the latter option. I lived in a shared apartment with 11 other exchange students. I think for exchange, it is a good option as it forces you to make friendships, learn about different cultures and get involved more easily to free time activities. Going with flatmates to Miramar, a beautiful beach nearby Porto. Portugal is a more collectivist country compared to an Individualistic one of Finland. Yes, TAMK and Tampere has plenty of student activities to offer but I felt in Portugal people see them more as “we” rather than “I”. A great way to get involved in the local culture is by joining a sports group in the university. It was a nice experience to be part of the university team. In addition to practices and games, the collectivism can be noticed by for example pre-game lunches where all teammates are expected to participate before the battle. If you really want to learn Portuguese, you should get involved in activities with the locals. As my studies were in English, I really needed to have some other places where I could maintain my Portuguese skills I’ve acquired from my high school exchange to Brazil. Not only did I play games with the ISCAP team but I also was welcome to be a part of a private futsal club, Sporting Clube de Silvalde. There I had to deal with the European Portuguese, learn new types of practices and some habits from the locals. It was a nice custom entering the locker room as teammates greeted every single person by handshakes. This is once again a difference between the Portuguese and Finns. Nothing wrong with the Finnish ways but it was nice to experience a more open and collectivist culture also. Sporting Clube de Silvalde, futsal team. In conclusion, exchange is mainly what you make of it. There are many possibilities to join student activities, make friendships with locals and even focus on studies if that is what you want. I had a nice experience on exchange, I hope you as well reading this blog post. I chose to apply for exchange in Portugal mainly for two reasons. First, I wanted to do the exchange together with my boyfriend and we needed to find a destination where they accepted more than one student from TAMK. Second, we wanted to live in somewhere a bit warmer and relaxed than Finland and escape from the grey and dark autumn months of Finland. So, when we found out about the city of Porto in Portugal we were sold. My exchange experience at ISCAP didn’t begin quite as well as I had hoped for. Already on the first orientation day we were told that the exchange would be one and a half months shorter than we were told before arriving. This was a disappointment for many and also messed up a many exchange students Erasmus grants. Later, during the orientation week we were informed that some of the ECT’s of the courses were actually lower than what had been written on ISCAP’s websites. So again, many of us exchange students were in trouble, because suddenly we didn’t have enough credits. But as the exchange went on I came to learn that this was very normal in Portugal. Anything was never clear and straight forward and as the Portuguese say you should just relax and take it easy. Otherwise studies at ISCAP were ok and I would say that the level of teaching and tasks were pretty much the same as in TAMK. However, what did disappoint me was that most of the courses I had were like basic level courses even though the when I was making the course decisions the descriptions had suggested the courses were more advanced. At ISCAP students have the possibility to choose either continuous assessment method or final assessment method for the courses. In continuous assessment students have obligatory participation on the lectures and essays and group works that they have to do during the course. In final assessment students don’t have to participate on the lectures at all and they only have one big final exam at the end of the period. I had courses with both methods and this way only had to go two times a week to the campus. I started my Portugal experience with a road trip together with my boyfriend. We flew to the southern end of Portugal to Faro and rented a car from there. We spent two weeks driving along the coast up to Porto. In my opinion there couldn’t have been any better way to start the exchange. During the exchange we also made quite many trips both in Portugal and abroad. Quite early on we made another road trip with a group of friends to the north of Spain to Vigo. A bit later we went on a one-day-trip with a company called Student Travels to see the Douro valley and its vineyards. In November we flew to Malta (with super cheap flights) and spent four days there. Just before Christmas we visited the town of Guimaraes which is said to be the birth place of Portugal. And the last four days in Portugal we spent in Madeira (highly recommended). In Porto there is also a lot to do as long as you love partying. If you don’t (as I don’t), then you might feel a bit left out from the exchange groups and it might be hard to find other activities. Luckily there are a lot of great restaurants in Porto offering food form all over the world. Downside to this is that most of my money went to the restaurants even though they are a lot cheaper than in Finland. When choosing Portugal as your exchange destination be aware that things don’t usually go as planned and that the culture is actually very different from Finland. For me since I guess I am a bit of control freak living in Portugal was very hard from time to time. However, travelling around Portugal and the destinations near it is amazing. Greetings from sunny and beautiful Porto! Porto is a very old beautiful city in the northern Portugal. It’s the second largest city of the country right after Lisbon. Porto is known for it’s gorgeous bridges along with the medieval riverside district (Ribeira) with it’s narrow cobblestone streets. It is also famous for it’s Port wine production. I spent my time trying to experience everything Portugal had to offer. I did trips to different cities around the country, went watching champions league games, tried experiencing different foods and drinks, but the most memorable trip was the trip we took to Azores islands. They are volcanic islands in the middle of Atlantic Ocean. They have very beautiful waterfalls where you can take trips to do canoying. They also have hot springs for relaxing and even volcanic hot beaches in the ocean! Universities are quite different from what I’m used to in Finland. The teaching is “old school”, as in you have to respect and call your professors by their title. 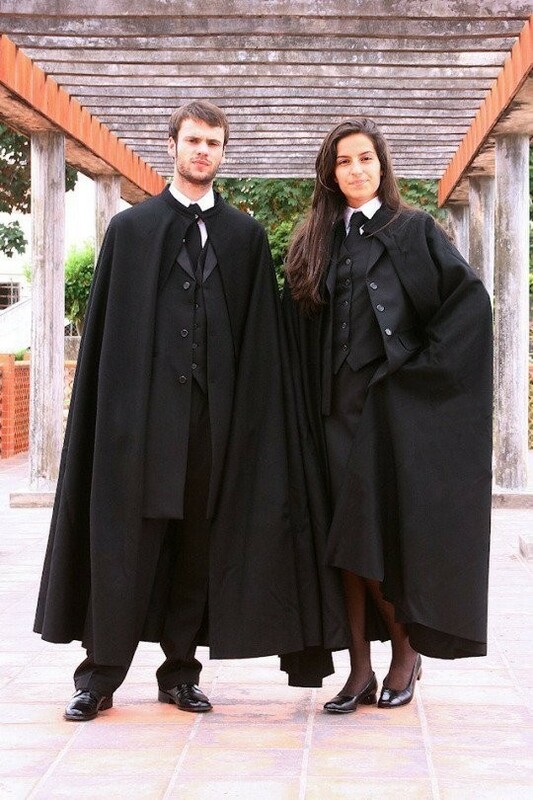 What I found extremely interesting was how the university students in Portugal dressed in these “Harry Potter” like school uniforms. It is known that the author of Harry Potter got the idea from these exact uniforms! The freshmen of universities go through embarrassing looking rituals every day during their first year. Also they have to wear the same white t-shirt and a paper “crown” every day for the whole semester without washing them even once. I talked with the freshmen about it and they all did it with pride because it was their traditions and I really respected that.